Available to purchase (first time on the market) ; a luxurious titled lakefront estate with a tropical, nature oriented flair. The Estate offers two fully furnished villas both with stunning views of the Lake (total of 7-8 bedrooms, sleeps 15 ). The two villas are situated on 6 acres of lakefront property. The smaller villa offers 2,600 sq. feet with a total of 3 bedrooms and 4 bathrooms. The main floor has an open floor plan with 1 bedroom and private bath on this level which opens to multiple sliding doors leading to a large stone patio, incredible lush gardens with full views of Lake Arenal. The second level has the master bedroom suite and a 2nd guest bedroom with a private bath as well. The master suite opens to two terraces and has a whirl pool tub, hand painted mural and views of the lake. The home is pre-wired for surround-sound and an electric fireplace. The larger villa has 3,500 sq. feet and offers 3 large bedrooms and 3.5 bathrooms. The first floor has an open floor plan integrating the kitchen, dining and living room areas. The kitchen is highly upgraded with an Italian stovetop, kitchen island and granite counter tops. There is a guest bedroom suite (private bath) on the first level, ½ bath and the living area opens to a lake view terrace. The second floor has a master suiteand guest bedroom with full bath. There is also on this level a study and lounging area with an electronic fireplace and surround – sounds. There is a third level that has an exercise and meditation studio with multiple windows, views and a bed area (could be an additional HUGE bedroom or suite/studio). Each villa on the second floor terrace has kitchenettes. There is an over-sized 2-car garage with plenty of storage space. 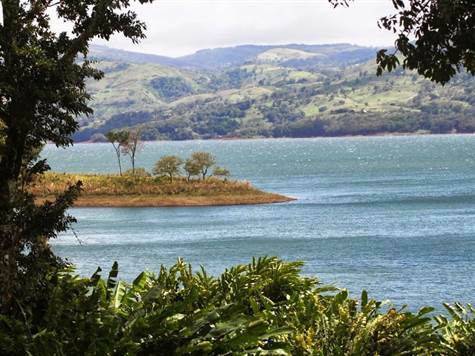 The location: 6 acres on the Peninsula of Santa Maria in Lake Arenal. There is direct and easy access to the lake. In front of the property and toward the lake there are walking paths, multiple flowers, plants, exotic trees and fruit trees – a tropical garden environment. Throughout the estate you will find four separate outdoor water features; koi pond, fountain, turtle and frog ponds. There is also a beautifully designed 20 x 20 foot teak platform that is covered and is used for yoga or exercise . You will find monkeys, sloths and innumerable birds that even the most astute bird watcher cannot identify! You have so many options in terms of where you want to enjoy the outdoors and what you will see and do: walking to the lake for kayaking, safe swimming, boating/sailing, sitting amidst the tropics, meditating on the yoga platform or exercising or merely enjoying the tranquility with your favorite book to finally read. The Lakefront estate is only 5 minutes from the center of Nuevo Arenal, a charming, quaint and bustling town that offers many services; banks, grocery stores, hardware, artisan shops, electronics, pharmacies, restaurants, churches, health clinic, gas station and more. The estate access road has very little traffic and the long garden laden driveway brings you to the villas – hidden jewels. Driving to the neighboring towns are the cities of Fortuna, Tilaran and down the mountain to the larger city of Cañas. It is about a two hour drive to the Liberia International Airport and a little further to a number of beaches, northwest Pacific. This Tropical Acreage Lakefront Estate is a great investment as a family compound, rental opportunity or as a conversion to a Bed and Breakfast (sleeps 15+). There is no other estate property developed along the titled Lakefront area and that offers 6 acres!